For most of the week, the Giants vs. 49ers betting line had the San Francisco 49ers favored by 2.5 points. The line is now down to 2 points at both of our recommended online sportsbooks. Of course the money line has started to move with the spread, and the over/under has dropped to 40.5 from 42 earlier in the week. The odds chart below will continue to update throughout the day, with the latest Giants 49ers betting lines. Both of the sportsbooks below welcome American bettors, along with Visa/Mastercard for making deposits. So far today, the money has been going on the NY Giants. Several ESPN analysts said they prefer the Giants in the wet weather, so that could be having an impact on casual bettors. If it continues this way, sharps will likely start betting on the 49ers at around 4:30pm ET. If this happens, the lines could move the other direction until game time. We’ll continue to watch the betting lines and keep you up to date. The San Francisco 49ers opened as 2.5 point favorites, but the line is starting to move now. This article is being written on Sunday afternoon at 3:30pm ET, and the 49ers vs. Giants point spread is now 2 points. 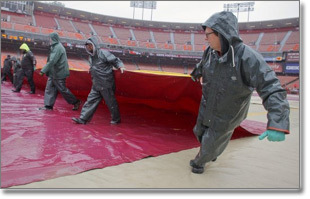 It appears that the rain has stopped in San Francisco, but the field could be a sloppy mess. Obviously this makes it harder to run, so we should see more of the passing game on both sides. This should give Eli Manning the advantage, and this should reflect in the lines as we get closer to game time. The line on the over/under has started to adjust as well, down to 40.5 from the 41.5 – 42 range it was in all week long. With the rain they’ve had in San Francisco today, we could see this drop another point before the game begins at 6:30pm ET. I’m not sure if we’ll see the spread get any closer than it is right now. Keep an eye on the odds chart above for the latest line movement in this Giants – 49ers NFC Conference Championship game. As we get closer to the start of the game, of course the betting volume will get heavier. As that happens, the betting lines will continue to move. Update 4:50pm ET: At BetOnline, the Giants are now +2 (-117), closing the gap. The 49ers are now -2 (103). This is the closest we’ve seen the Giants – 49ers point spread. The Giants-49ers over/under is the same at BetOnline and JustBet, but BetOnline is our #1 ranked betting site for NFL football. If you take your betting seriously, it’s all about getting the best prices. Timing is everything if you want to get the best lines and make the most money. Watch the Giants 49ers lines closely and place your bets when the timing looks right. A lot of sharps will be betting late, within 1-2 hours of the start of the game.